Summer and reading go hand in hand. Whether you're forced into it à la high school English class or simply love reading on your own, summer is a fantastic time to crack open a good book. So settle down in a beach chair on a sunny day or on your couch when those thunderstorms are raring and pick up one of these reads! 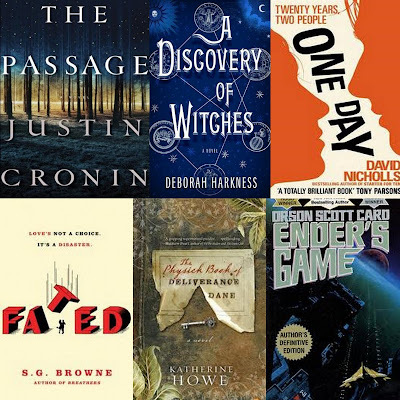 Whether you choose a post-apocalyptic novel or a classic story you haven't had a chance to read, these books are guaranteed to take you far away from your every day life. If you're going to read one book this summer, or this year even, make it The Passage. While its intimidating size (approximately 800 pages) has frightened some readers away, those who have taken on the challenge have not regretted it. The author himself describes the novel as a story about a girl who saves the world, but The Passage is much more than that. While readers discover early on that the world has ended due to a scientific experiment gone horribly awry, the way that Justin Cronin tells the tale of the destruction of our society creates an unbelievably gripping story you will be unable to put down. Suffice it to say that after I'd started this novel, I spent two days with the book either in my hands or sitting next to me while I waited to pick it back up again. Once you start this engrossing book, you simply won't be able to stop reading it! Harkness has created a beautifully diverse world where vampires, daemons, witches and humans coexist, despite humans remaining unaware of the existence of the other species. The novel's protagonist is an alchemical scholar writing an academic paper in Oxford before accidentally calling a book out of the stacks. Little does witch-born Diana know that this book has been missing for hundreds of years…or that all three of the supernatural species desire to possess it. A Discovery of Witches begins as a mystery revolving around a book and rapidly becomes a history of the magical world. Despite the obvious similarity between this book's main romantic story and the romance between Bella and Edward in the Twilight Saga, I enjoyed being a part of the world Harkness created. Are you a sucker for stories about friendship and love? What about tales that focus on friendship and love spanning the course of 20 years in what feels like the blink of an eye? David Nicholls’ One Day tells the story of Dexter and Em by touching base in their lives on July 15th each year, giving you a glimpse into events that have passed and the large and small moments that comprise their lives. Dex and Em are both lovable and exacerbating, and their experiences ring true to how life (at least for this writer, and at least thus far) takes you to places you never expected and changes the opinions you so firmly believed in during your youth. That said, a warning—Nicholls’ shows no mercy when it comes to exposing his characters and readers to painful, traumatic events. Prepare yourself for some heart-wrenching moments. The thing about Fated is that it’s awesome. (Read the book and you’ll get why this is funny.) In all seriousness, S.G. Brown’s Fated is a richly crafted tale about Fate’s role in modern society. Known socially as Fabio, Fate is tired of his job and envious of Destiny’s, who guides humans on their paths to success whereas Fabio is tasked with helping the average Joe make it through the day. When Fabio falls for Sara, a human on Destiny’s path and strictly off limits, he finds himself breaking all the rules to be with her – and to improve the lives of his humans, who he stopped caring for hundreds of years ago – and consequently changes his own destiny. With excellent supporting characters and clever narration, this is definitely a fun summer read. While I’m not a huge fan of novels that explore historical periods side by side with a more current narrative, I thought Howe did an exceptional job in Physick Book. Readers will meet Connie, a Harvard graduate student in the 1990s who is searching for the subject for her doctoral dissertation. While Connie looks for the subject that will guide her life for the next few years, she also begins the arduous task of cleaning and restoring her grandmother’s house near Salem. Yes, Connie’s search leads her to the life of seventeenth century witches in Salem. While that’s no surprise to anyone reading the novel, what I found surprising was how strongly I wanted to curl up in Connie’s grandmother’s library and sit in her favorite armchair. Definitely an enticing read, the Physick Book is a beautifully written historical mystery that also manages to force the reader into seeing the past in a new light. Time to change things up a bit and go with an oldie but a goodie. Written more than 25 years ago by Orson Scott Card, Ender’s Game is a science fiction masterpiece that still enthralls new fans each year. Andrew Wiggen, known as Ender because he is the embarrassing third child in a society where having two children is the acceptable norm, is an exceptionally bright and gifted young boy plucked from his home by an organization whose sole focus is protecting the human race from extinction. Why? Because Ender is Earth’s greatest hope against the Buggers, an alien race that has nearly destroyed humanity twice. Ender is sent to the Battle School, where he is tested beyond all others to prepare him for his destiny. The biggest question you must ask yourself when you read Ender’s Game is this: will they break Ender’s brilliancy and compassion for others… or will he save the world? Trust me when I say you want to find out the answer. Ender's Game is awesome... gonna check some of the others out, too! I went out and got The Passage -- excited to start! trust me, the Passage is worth it!